Fatty Acids: Chemistry, Synthesis and Applications is a comprehensive source of information about a wide range of industrially important fatty acids. This practical resource provides key insights into the chemistry, synthesis, industrial applications, derivatives, and analysis of fatty acids, and the chemical modifications that transform them for use in products from biodiesel fuels to pharmaceuticals. Written by a team of industry experts, Fatty Acids includes detailed descriptions of fatty acid crystallization, enzymatic synthesis, and microbial production. This book focuses heavily on the chemistry of trans fatty acids, with extensive explanations of their synthesis and measurement. 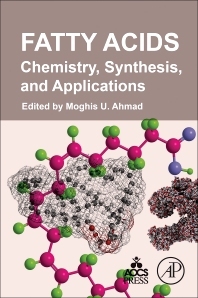 Further, the book addresses advances in the analytical methodology, including mass spectrometry, of fatty acids as well as their derivatives. This book serves as a reference manual to a new generation of lipid scientists and researchers; a useful resource for oleochemical industries; and a valuable teaching aid for undergraduate and graduate students who are interested in fields related to the chemistry of oils, fats, and food. Dr. Moghis U. Ahmad obtained his Ph.D. in Chemistry (1978) from AMU, Aligarh, India; and did post-doctoral research from Texas A & M University, Department of Biochemistry & Biophysics, College Station, Texas, and Oregon State University, Department of Food Science and Technology, Corvallis, Oregon. Dr. Ahmad has extensive experience in basic and applied lipid research and development. He is an expert in the synthesis of lipids and their related products. He has developed and successfully marketed many novel lipid products for the chemical, pharmaceutical and biotechnology industries. His research is detailed at great length in more than 60 research publications in peer reviewed journals and book chapters, and in more than 30 patents and patent applications. Most of his contributions remain the company proprietary. He has recently edited two best seller AOCS books, namely Lipids in Nanotechnology (2011) and Polar Lipids: Biology, Chemistry, and Technology (2015). Dr. Ahmad stature is recognized internationally. He is an elected Fellow of the Royal Society of Chemistry (2011) and AOCS (2014), and the recipient of the prestigious Alton E. Bailey Award (2016) and Stephen S. Chang Award (2017). He chaired the AOCS Phospholipids Division (2009-2011), and is currently a member of the AOCS Books and Special Publication Committee. He also serves the executive committee of the International Lecithin and Phospholipids Society (ILPS). Currently, Dr. Ahmad is Vice President of Chemical Technology & Manufacturing at Jina Pharmaceuticals Inc., Libertyville, Illinois.